The holiday season has its traditions. For some, it’s putting up twinkling lights, last-minute shopping, and celebratory parties. For me, it’s memorable dinners. My holiday wining and dining kickoff is at Seaview’s Shelburne Inn. The Wild Mushroom and Pike Brewing Dinner, now in its eighth year, has one common ingredient in each course — wild mushrooms. And more often than not, a splash of Charles and Rose Ann Finkel’s accompanying brews. A few of the memorable dishes over the years were a cedar planked salmon with Man on Horseback mushrooms, lemon confit and pine nut relish; a duck and Porcini mushroom pie; Canary, Delicioso and Red Russula mushrooms, squash and white cheddar gratin; a luscious deconstructed Lobster mushroom lasagna; and an incredible elk shoulder pastrami bruschetta with Anjou pear and King Boletus mushrooms. Sometimes, even the dessert has mushrooms. Sounds sort of weird, but the house-made Pike Stout ice cream in a Porcini Florentine cookie topped with pumpkin caramel and Porcini brittle was so decadent, I might have licked the plate. This year, we sat down to a cream of wild mushroom soup with a touch of cayenne perfectly paired to Pike’s Hive Five Honey Ale. For this ale, Pike Brewing collaborated with the Salish Lodge. On the hillside above the famed lodge are their beehives and their honey used to make this gold medal-winning ale. Perfectly paired with the Kilt Lifter Scotch Ale was a pretzel sandwich stuffed with a pork and wild mushroom sausage, peppers and more mushrooms. Next up was a pan-seared king salmon with sautéed wild mushroom and a huckleberry demi-glace accompanied by Pike’s Monk’s Uncle, a Belgian tripel-style ale. Then an elk sirloin with a wild mushroom risotto partnered with Pike’s Entire Imperial Russian Stout 2016. 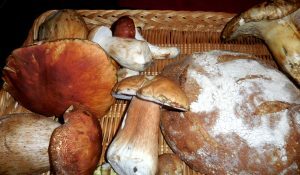 A longtime fan of wine, I asked if we could enjoy a bottle of wine with these wonderful mushroom dishes. The salmon and the elk and mushroom risotto were outstanding with Knudsen’s Pinot Noir. Another pre-holiday tradition is a harvest potluck with friends. For that occasion, it was another Oregon Pinot that stole the show. We began with a Kitzke 2011 Red Mountain Nebbiolo, salami and cheese. Nebbiolo is the late-ripening grape of the Barolo and Barbaresco regions of northwest Italy. Traditionally, Barolos can be long-lived, 15 to 25 years; Barbarescos, the more approachable, in 5 to 10 years. Before Barolo can be released, it has to have been aged three years, two in cask and one in the bottle. This was because Barolo tended to be very high in tannins as a result of the traditional three-week fermentation on the skins. That was the traditional way. The new generation is more inclined to produce a wine with an “international” profile that doesn’t need to age as long. This controversy has sparked the Barolo Wars. The Nebbiolo was showing its age, in a good way — light in color, a slight brick rim and a silky mouthfeel. With only 30 months in neutral oak, the aromas and flavors showed traditional rose, faint cherry and a bit of tar. Next, Raptor Ridge’s 2016 Chehalem Mountains Grüner Veltliner was a beautiful match to the Geoduck Carpaccio with Shichimi Togarashi citrus vinaigrette. An unusual find in the Pacific Northwest, Grüner Veltliner is a refreshing, peppery white wine with stone fruit flavors. 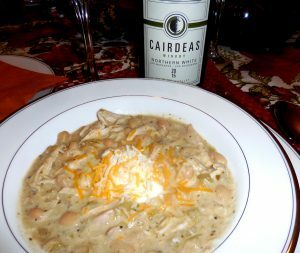 Chelan’s Cairdess Northern White accompanied the chicken white chili. This Rhône-style blend of Marsanne and Roussanne from Boushey and Lawrence Vineyards was packed with peach and mineral flavors. The crowning glory of the dinner was the sous vide tri-tip steak. Sous vide (French for under vacuum) is a new kitchen gadget that’s like cooking in a hot tub. The meat evenly cooks in a baggie in a water bath for much longer time than normal. This ensures all the moisture is retained. The Tri-tip came out very rich, tender and silky. We had two very different wines with this course. 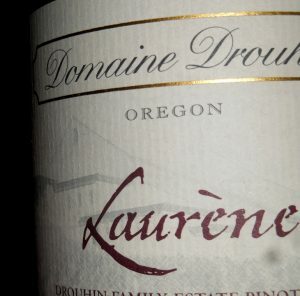 The first was the Domaine Drouhin Louise 2007 Pinot Noir. Not a great year for some producers, much depending on when the grapes were picked. The 2007 spring came off without a glitch; summer was cooler than most without any heat spikes that could disrupt the growing season. Everything was great going into harvest — and then it rained. Some picked early to get it in before the rains, but the grapes weren’t really ready. Some harvested between the rain events, hoping for some usable grapes even if they had not fully ripened. But those who waited while gnawing on their nails fared the best. The Louise opened to tart cherries with a bit of leather and dust, the acidity was good and the color youthful for a 10-year-old wine. It was a very nice bottle. Next, we poured a 2015 Yakima Valley Sheridan Cab. The difference was night and day, one elegant with age, the other elegant in its youth. Big and rich, ripe plums and pencil lead, this wine knocked our socks off. We were all grinning over the awesome aromas of plums, cassis and pencil lead. 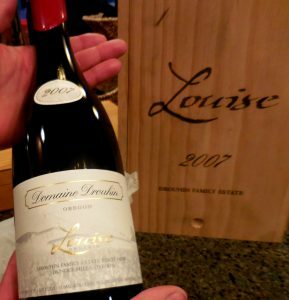 But the pièces de résistance was the Domaine Drouhin Oregon Louise 2007, the “Rolls Royce of Oregon Pinots” according to our host. I agree. The Louise cuvée had the most compelling perfume. From the Red Hills of Dundee, the grapes were handpicked, sorted, de-stemmed, and then slowly fermented. For each vintage, DDO focuses on a few favorite barrels that, once nurtured and blended, will become the Louise. Typically in barrel for 15 months, it maintains balance because they use only 20 percent new French oak. The lesson learned is not to dismiss rainy vintages. Winemakers working with what Mother Nature gives in a cool vintage, have higher acid levels and lower alcohol levels than usual, and with patience, producing some of the most lovely, fragrant wines.